The Tread of Pioneers Museum is closed for cleaning and maintenance from April 14-29. We will re-open on Tuesday, April 30, and will resume normal business hours of Tuesday - Saturday, 11am-5pm. History of the Museum - Since 1959! 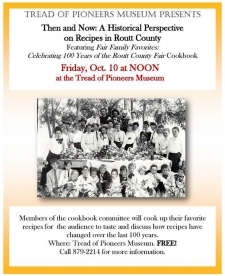 Nancy Mucklow and other cookbook contributors will cook up their favorite recipes for participants to taste and discuss how recipes have changed over the last 100 years. Where:Tread of Pioneers Museum. FREE! Call 879-2214 for more information. Routt County residents are free with I.D.